During a recent chat with a medical specialist, the doctor handed me a packet of information about a procedure he wanted me to consider. When I opened the packet at home, I found a printed brochure, several other papers and a DVD. As you might guess, I started my research by watching the video. In today’s world of YouTube and 500-channel TV services, we are all getting more focused on video. A story told with moving images and sound can easily have more impact than one told with world and static images. Cards in Motion is a media production company that has found a way to build a brochure that incorporates printed information, still images and full-motion video. Their brochures represent a logical evolution beyond the DVD that my doctor gave me. 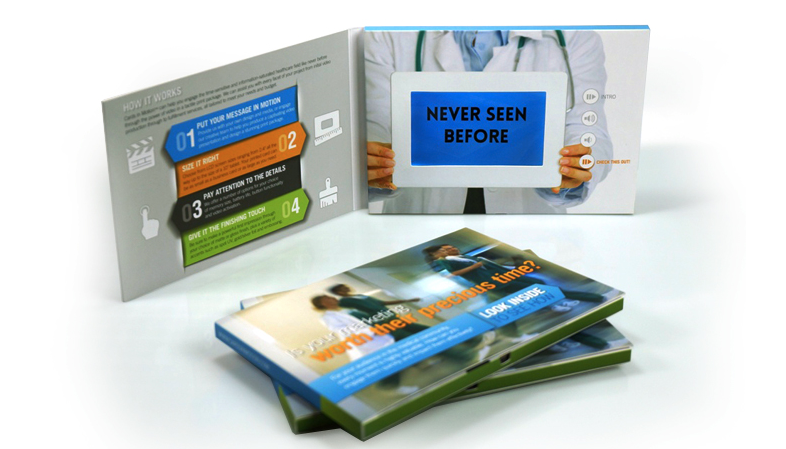 In their brochures, the video plays on an embedded LCD screen when the front cover is lifted. The video mailers are custom designed to fit each client’s needs and budget. Screen sizes can be as small as 2.4" — about the size of the screen on an iPod Nano - 10.1" — larger than a standard iPad. Prices for the brochures vary, depending on the screen size and number of units ordered. To request a quote, visit the Cards in Motion website.